ALBUM PREMIERE: Stream GEORGE KOLLIAS Debut Solo Album "Invictus"
After successful appearances at sea on Motörhead’s Motörboat and Shiprocked as well as an unforgettable show before NAMM in Anaheim this past January, Metal Allegiance has signed their first-ever record deal with Nuclear Blast Entertainment. The world-wide deal stems from the popular musical collective uniting to write and record original material this past Winter. 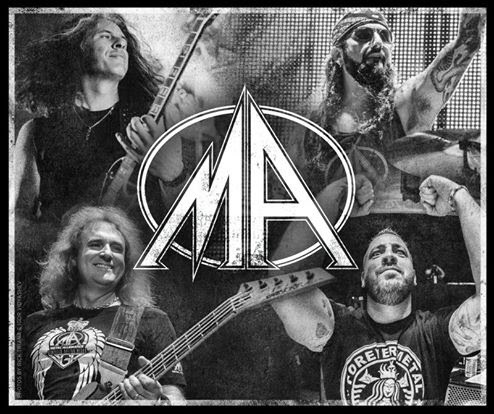 Brought together by Metal Allegiance principal partner Mark Menghi, the original material came together from the creative minds of David Ellefson of Megadeth, Mike Portnoy of The Winery Dogs, and Alex Skolnick from Testament alongside Menghi. The four writers then reached out through their metal rolodexes to a diverse lineup of performers, each adding their own personal musical stamp to the collection of 9 original songs. More information on the performers and individual track lineups will be released in the near future. The debut album from Metal Allegiance is slated for release this Fall. Nuclear Blast Entertainment President Monte Conner offered up his label as the home for Metal Allegiance after several meetings. Upon hearing the demos and seeing the list of performers, he felt it was something he wanted to be a part of. Stemming from an initial idea in 2011, Metal Allegiance was born as a way to unite a collection of hard rock and heavy metal’s most notable musicians in a setting born under one ideal, a love of music and performing. In 2015, that ideal still holds true and has become the foundation for everything Metal Allegiance; furthered with the release of the upcoming debut album. While the lineup may change, the passion, the energy and the emotion all remain the same. Metal Allegiance is more than just a record or a concert, it’s an experience and a lifestyle. Previous participants in Metal Allegiance live events have included: Philip Anselmo/Rex Brown (Pantera), Joey Belladonna/Frank Bello/Charlie Benante/Scott Ian (Anthrax), David Ellefson (Megadeth), Gary Holt/Kerry King/Dave Lombardo (Slayer), Chuck Billy/Alex Skolnick (Testament), Troy Sanders (Mastodon), Mike Portnoy (The Winery Dogs) and Andreas Kisser (Sepultura) to name a few. These unforgettable events have also spawned surprise appearances by the likes of Geezer Butler (Black Sabbath), Phil Campbell/Mikkey Dee (Motöhead), Steve Vai and Billy Sheehan (The Winery Dogs).